Having an organized bathroom can help make your mornings run smoother, speed things up, and it sure does make cleaning a lot easier. But for such a small bathroom, organizing can be a real challenge, especially if you’ve got lots of essentials that need to fit in there. So I did what I usually do. 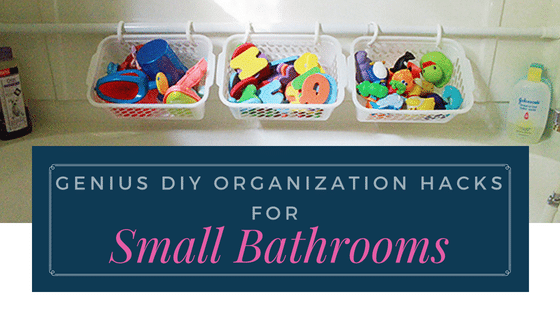 I browsed the Internet and I found some really genius organization hacks that you can easily DIY, which if done right, will even give your small bathroom a bigger view. 1. Make your own basket system. Baskets are awesome! They’re pretty. You can choose whether you’ll use a small basket or a big one. And they are really great for storage! 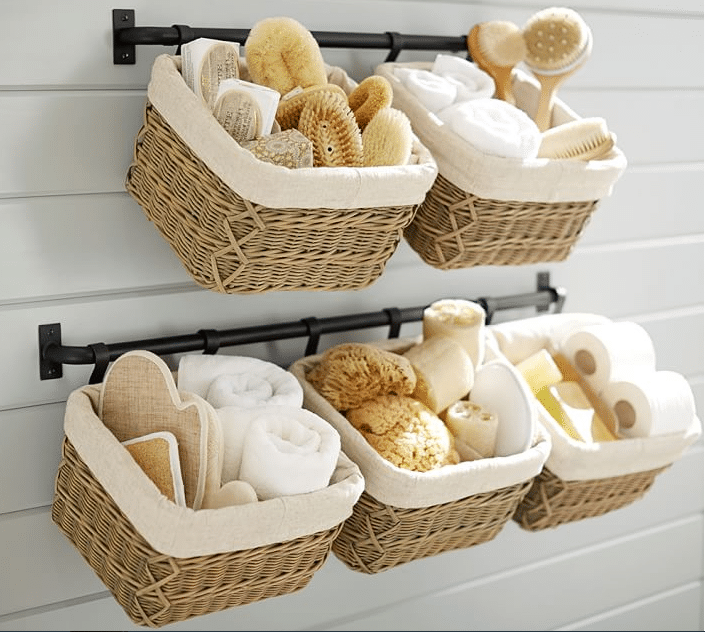 To make your own bathroom basket system, get some baskets, attach them to curtain rods and you have a stylish holder for your sponges, brushes and mini towels. Or maybe you prefer to have them in the wall cabinet? 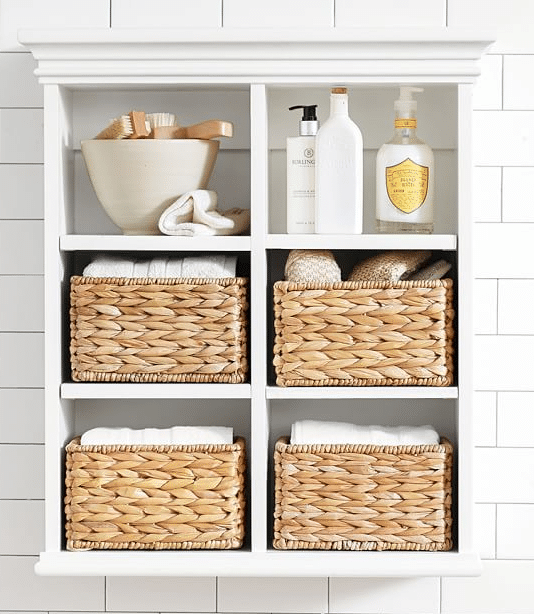 Whatever your choice is, you can always have the best storage with baskets. That’s how flexible this thing is! So I’m pretty sure that if you opt to use one in your bathroom, you’re gonna love it! I just love the way ladders spark creativity! I mean, come on, it’s a ladder. Who would think a ladder is an organization tool? Yet it is! From the bedroom, to the kitchen, and now the bathroom, I’m beginning to learn that ladders can be something other than a thing to step on. And I love that plant on top! Yeah, did you see it? 3. Use the vertical space above the toilet. Yes, you can use that! That space over the toilet is often left unutilized. I don’t know why. Given a small bathroom, that space is something. So why not install shelves or cabinets in there? 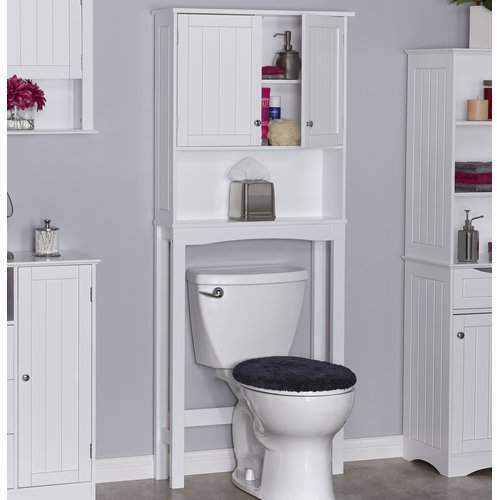 Or perhaps invest in a furniture that you can easily fix behind the toilet? Well, when it comes to that space behind the toilet, I can confidently say, you don’t know what you’ve been missing until you try it! 4. Towel bars on the door. Who says you can only have one towel bar on the door? Martha Stewart has three and you can have that too! If that’s a space saver, why not, right? 5. Relocate your hair appliances. Do you always have to go under the sink to get your straightener and hair dryer? Dream Green DIY doesn’t do that. And you shouldn’t too! 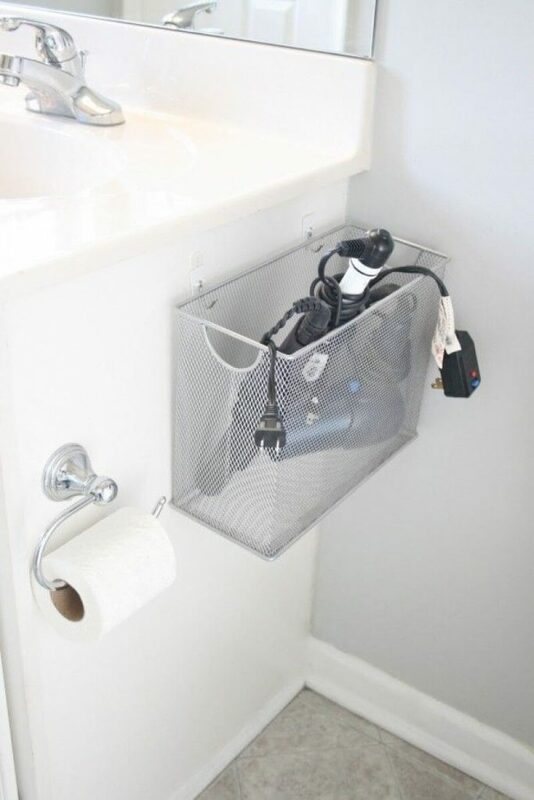 Hang a metal (not flammable) desktop file box beside your sink. Then store your electronics there. It’s both safe and stylish. Now whenever you need a quick hair fix, your tools are just within your reach. No need to go under the sink again! 6. Let the shelves float. It’s true that women can simplify. But you just can’t part with all your personal care products! If your area is too small for a cabinet, and not much counter space either, small shelves on the wall will do the trick! Vertical storage may not be that much but it can be your best solution. Now you have a space for 150 makeup brushes. Nah.. just kidding. You probably have less than that. But we’re not yet done with open shelves. You can also install them above the toilet. If cabinets look too crowdy for you, or they just are too difficult to fit in there (talk about space), go for open shelves! Stop rummaging through your cosmetics every morning. 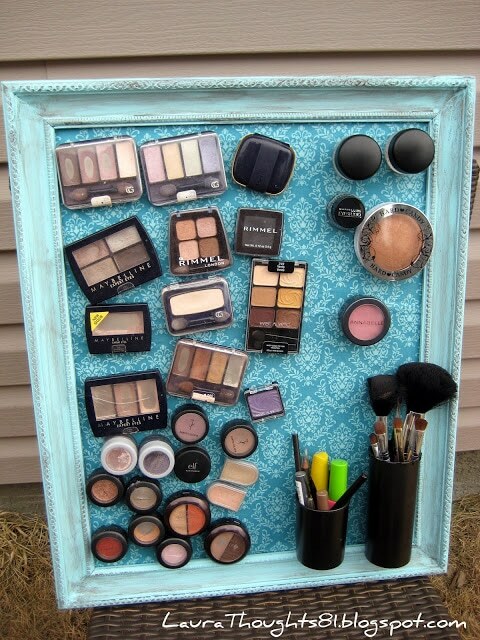 See your choices fast by creating a makeup magnet board like this. 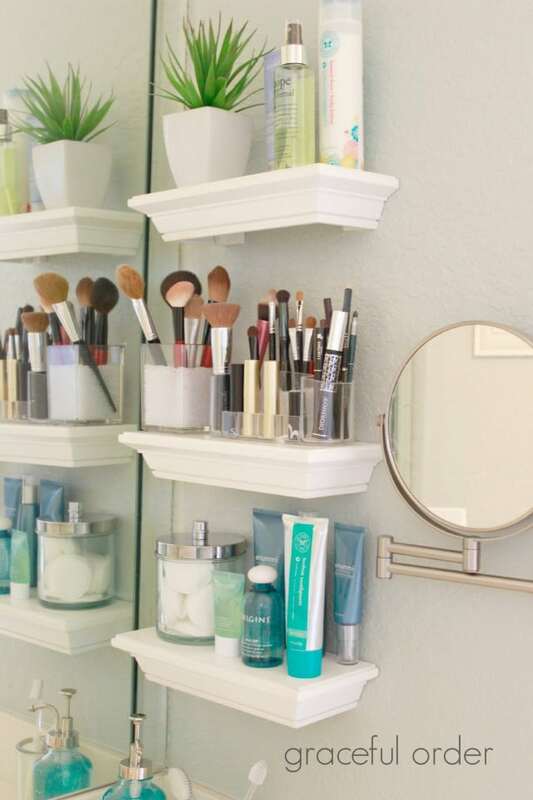 Now if you like keeping your makeup essentials in the bathroom, just bring the magnet board there. 8. Install a wine rack. But not for wine of course. It doesn’t always have to be a towel bar. 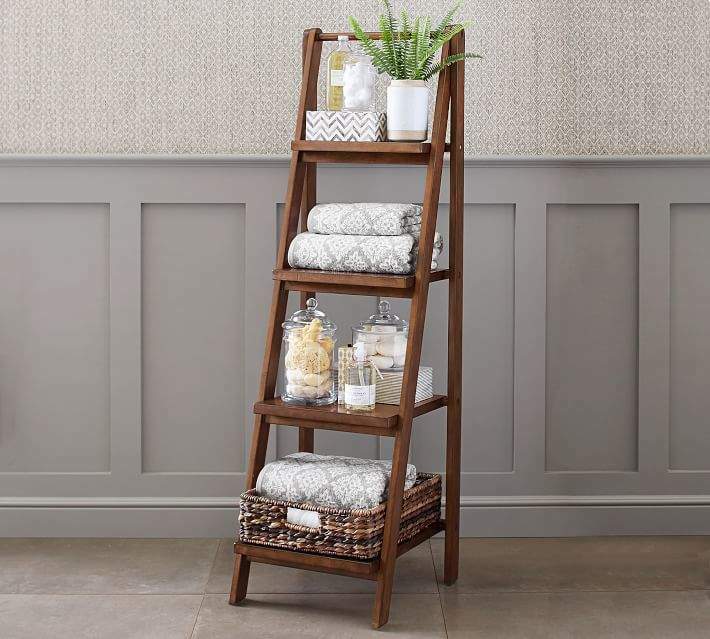 Wine racks make great towel holders too. Just roll the towels and tuck them in! 9. Use clear glass jars. Everyday items like cotton balls, q-tips and soap may not be decorative at all. But if you place them in glass jars, they’re like artwork in the bathroom! No need to hesitate to bring them out in the open. You can also check at a glance whether you’re running low on these supplies and need a refill soon. 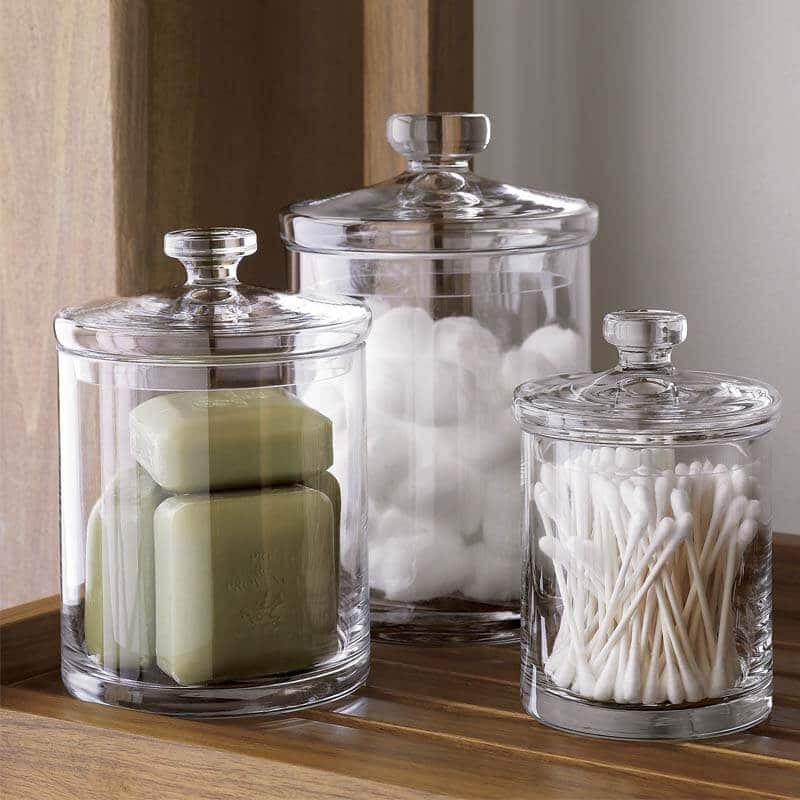 If you’re worried that you might drop these jars, and cause a little incident in the bathroom, you can use a clear plastic apothecary jar instead. You still get the elegant look but without the risk of causing mishap just in case you drop it. 10. 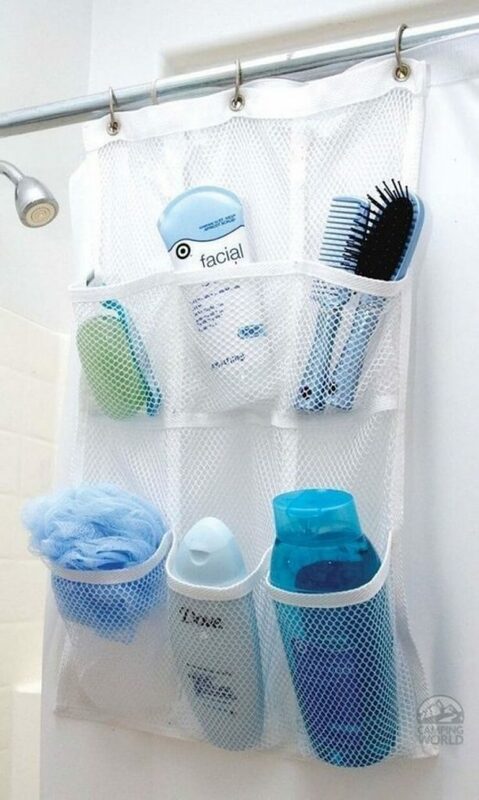 Try a shower pocket organizer. You can hang this from the shower curtain rings so it’s really very convenient to use. And it’s also hidden behind your shower curtain so it’s out of sight when you’re not using the shower! 11. 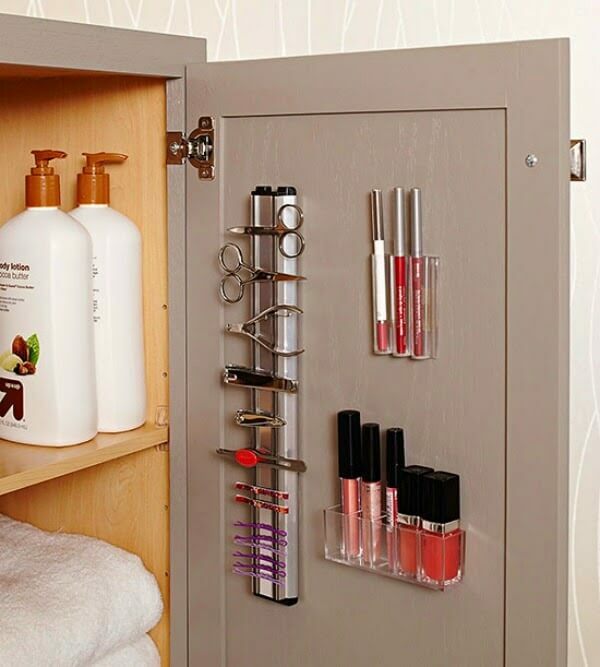 Use the inside of the cabinet door. 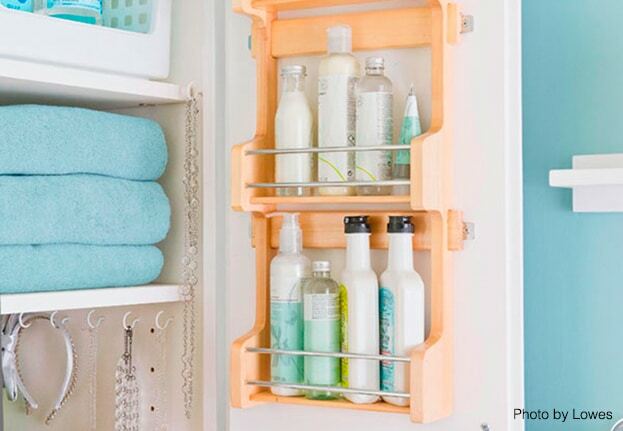 You can use a spice rack to hold your bottles of shampoo, conditioner, lotions, body wash and all those essentials. Another great way to use the inside of your cabinet door is by attaching a magnetic knife strip and adhesive containers. This can hold your scissors. I mean cosmetic scissors like tweezers and eyebrow scissors! Did you just think of craft scissors? Nah… Never mind. I know it’s just me. Well, all I’m saying is that you can also use that space for your cosmetics like bobby pins, metal beauty tools, makeup and nail polish. 12. Use small plastic baskets from the dollar store as drawer separators. If you know how it feels everytime you need to rummage through everything in your drawer, because you need a blush on and you know it’s there (but now you’re wondering whether you really put it in there), then you know how important it is to organize, separate, and keep similar items together. Luckily, you can always find small plastic baskets at the dollar store. Oh I love it when it doesn’t cost that much! Don’t you? 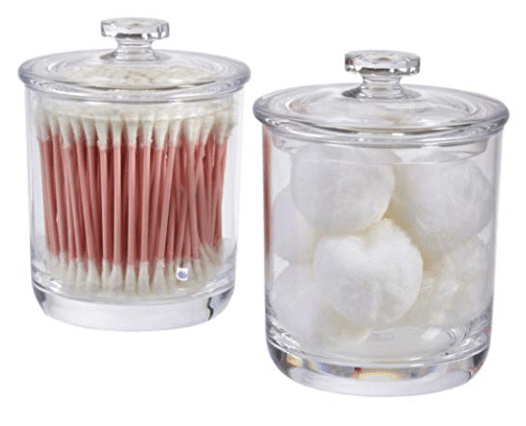 From your makeup, to your brushes, toothpaste and mouthwash, you name it, you can use these little baskets to hold them and separate them from each other. When these items are separated, you can easily spot what you need. You don’t have to keep rummaging through your things just to get that blush on, or anything that you need. 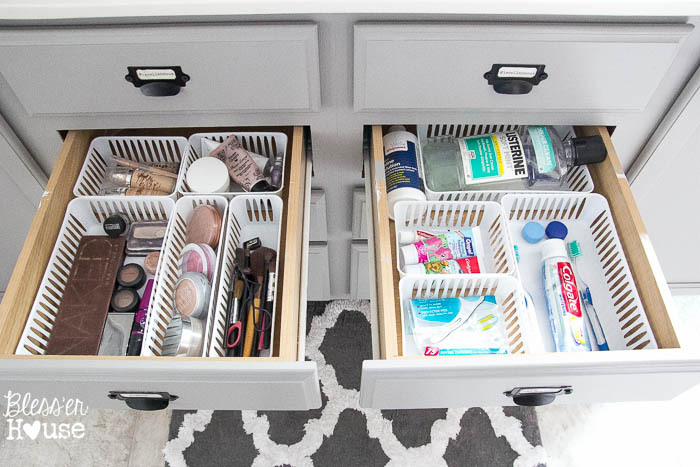 Give these little baskets from the dollar store a try, and give a new life to your messy drawer! Get some small canvas bags, install hooks on the wall, then hang the bags through a rope. Use them as holders for any of your bathroom essentials. If you’re not fond of shelves, you can use this as a pretty alternative. 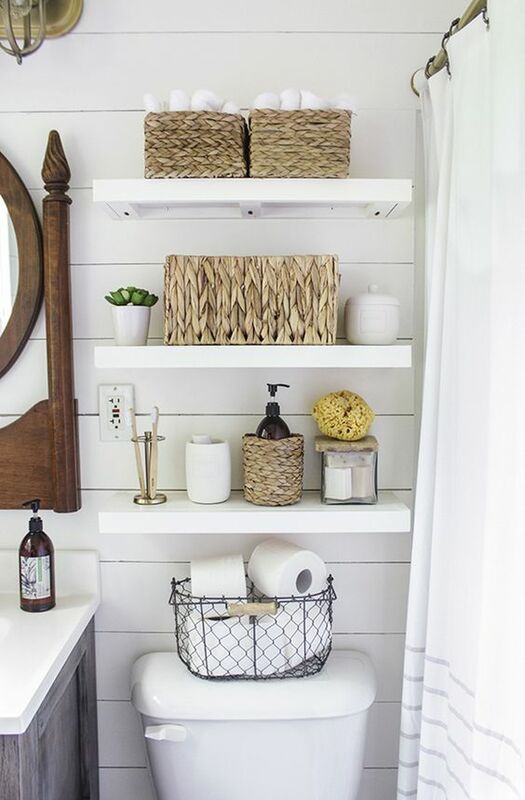 But if you have more space, then you can just let the shelves be, and let these bags serve not only for storage but an artsy addition to your bathroom! 14. How about some trays? 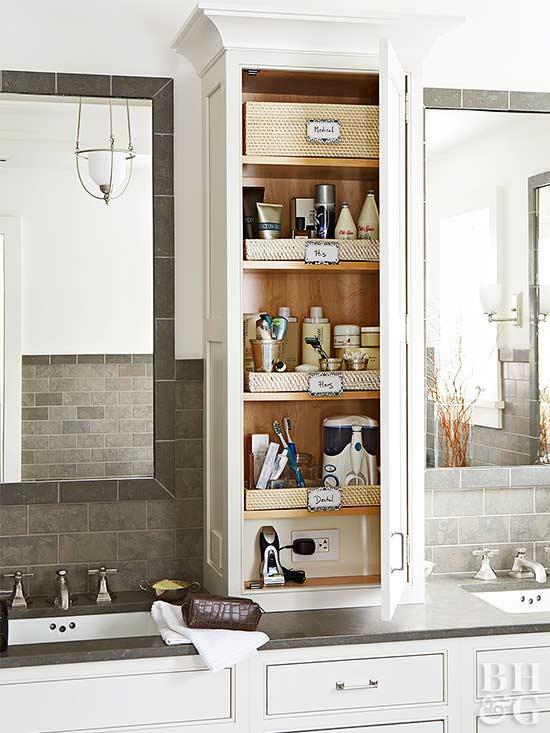 A shallow container, like a tray, makes it easier to see all your bathroom essentials. It’s also a great separator especially if you’re sharing that storage space with your whole family. Just don’t forget your labels! And I would even add the word “classic”. 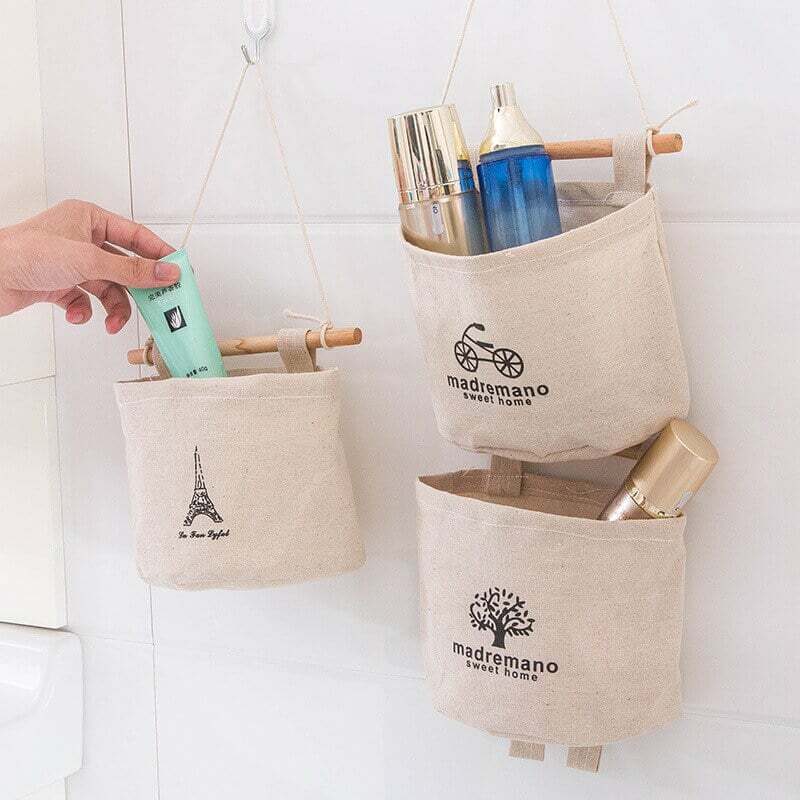 A hanging shower caddy will work on any bathroom, big or small. Usually, it has the following components. a hook that can be wrapped around the shower head. You don’t need this feature if you don’t like the caddy wrapped around the shower, but if you do, you should know that there’s something like it. 16. Curtain rods, hooks and plastic baskets. 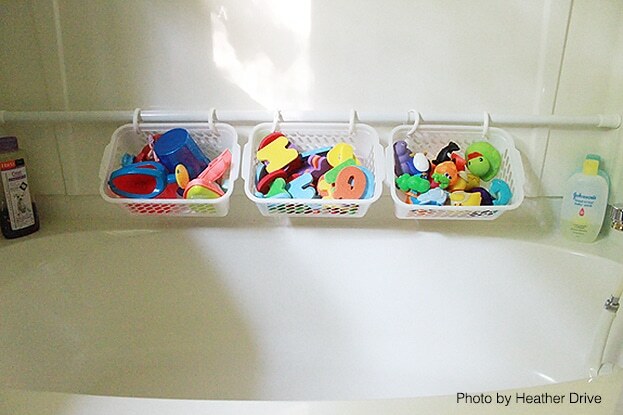 This is a really clever organization trick that is very practical to organize your kids’ toys in the bathroom. Add a shower curtain rod beside the bath tub. Slide some curtain rings or hooks on the rod. Then use the hooks/rings to hold the baskets. Now your kids’ toys can have a safe place to stay. You can also apply this to your bathroom supplies. 17. 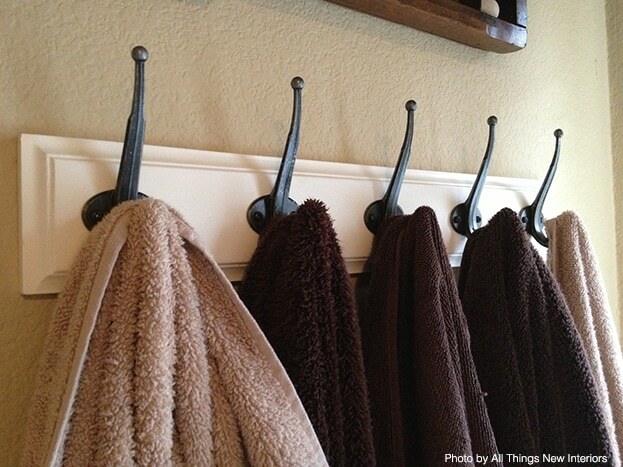 Use coat racks for towels. Has it been your practice to put one towel over the other? One of the greatest challenges of sharing space with your whole family is that everyone has got his own towel – hand towel, bath towel, towel for the dog (ouch). 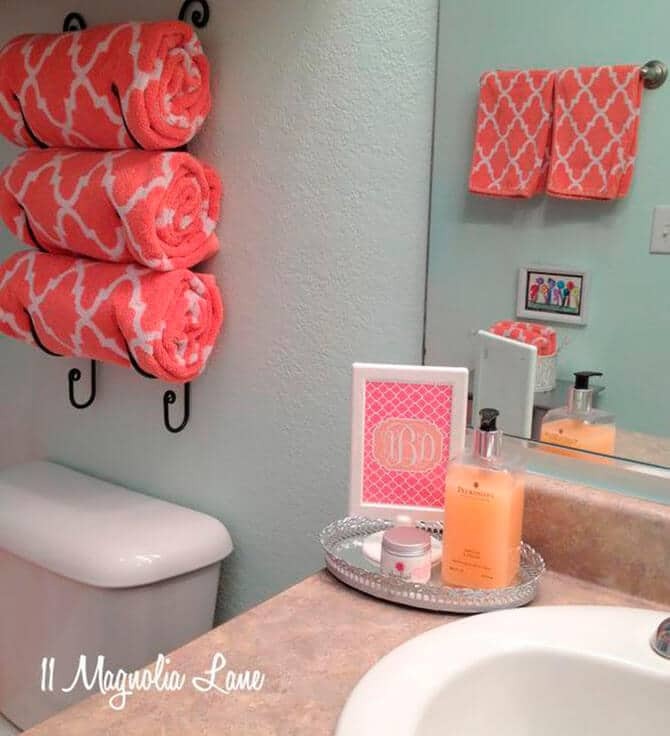 If towel rods limit you into hanging just one or two towels, use a coat rack instead. Since a coat rack comes with four to six hooks, this gives you more space for additional towels. 18. Add a shelf above the door. If the space above the door is wide enough, build a shelf on top of it. 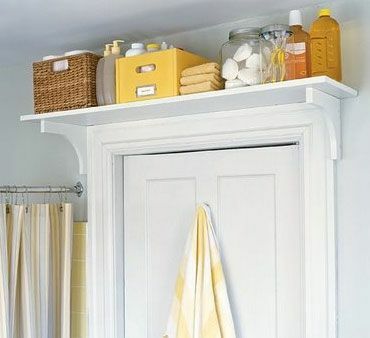 You can use that space for bathroom essentials that you don’t regularly use like extra towels, bathroom supplies like tissue paper, soap, shampoo, conditioner and cleaners. If it’s your habit to dress up or do your final touches in the bathroom, this is indeed very helpful. 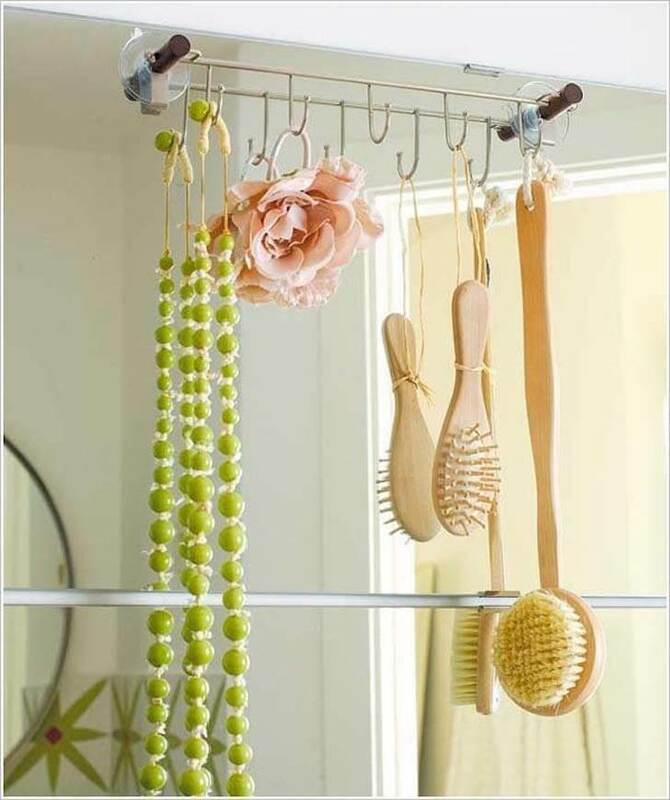 You can hang your accessories, ponytail holder, your comb, brushes and other essentials. 20. Utilize under the sink space. The space that you can’t possibly miss – under the sink! This may be a bit hard because of those pipes. 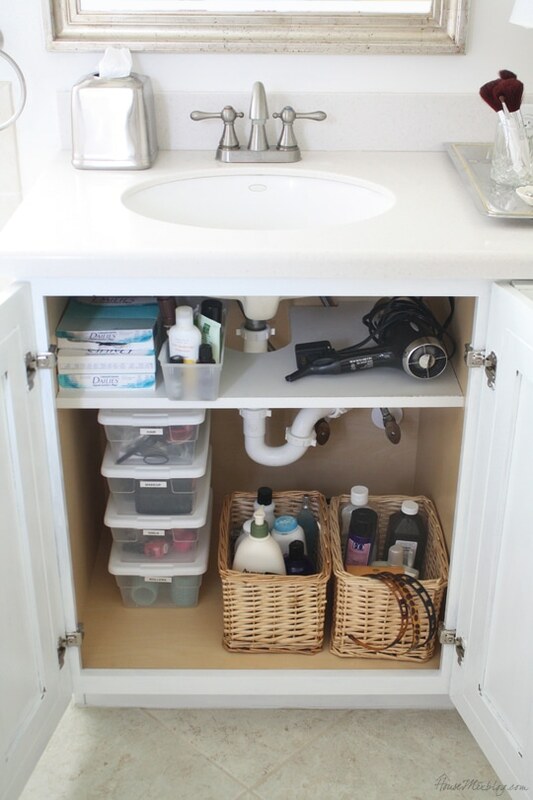 But just like above-the-door, under the sink space is also great for essentials that you don’t use everyday. However, it depends on how you organize things down there. Build a shelving around the pipes so you can divide the space if that’s too wide. Get clear storage containers for smaller items. You can get some from the dollar store so it doesn’t necessarily have to be expensive. Don’t forget your labels! You can also hide your bathroom electronics in there. Your bathroom can be spotless. Big or small, it can be the most organized room in your house. 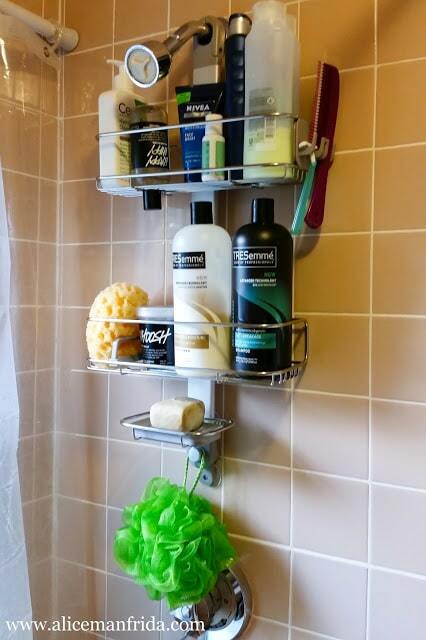 I hope I have given you ideas and inspiration so that you can have an organized bathroom from now on. Small space is not a problem. It’s just a little challenge that forces you to tweak things a little so that you can neatly store your things. So see your space for what it really is, be creative, and make the most of what you already have.